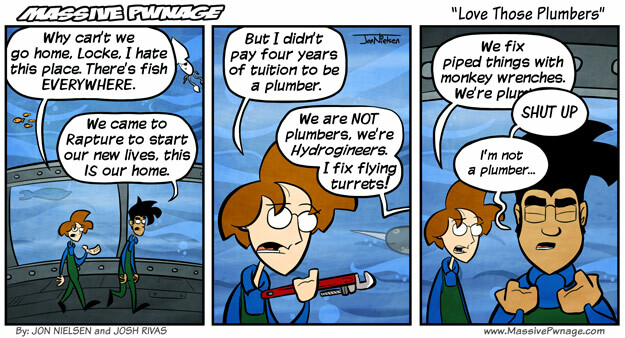 What’s the difference between a monkey wrench and a pipe wrench? Other than the involvement of a monkey, which couldn’t possibly go wrong. Available now, get the entire first year’s worth of Massive Pwnage in one, ultra-portable tome of epic power. Find it only at the new Massive Pwnage Store! This entry was posted on Friday, June 25th, 2010 at 12:00 am and is filed under Comics. You can follow any responses to this entry through the RSS 2.0 feed. Both comments and pings are currently closed. Err….i dont quite understand the joke. But im definitly getting one of those books….i couldnt find the price tag on the page..
O wait..heh..helps to look at the very bottom.